What child doesn’t like elephants? The cover and pages 6-11 of this month’s Ranger Rick Jr. have wonderful pictures and facts about the largest land animals. 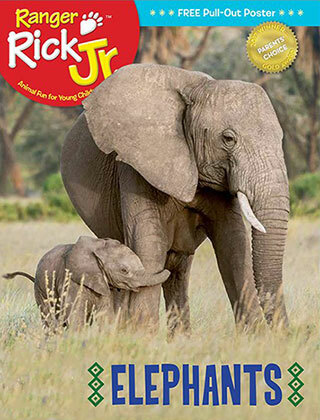 As you read about elephants with your child, compare the similarities and differences between their lives and ours. Here are questions to ask—along with possible answers—while looking at pages 8-9. On pages 10-11, there are twelve elephants in the three photographs. Ask your child to count them. Talk about which elephants are the largest, the smallest, the youngest, and the oldest. Turn to page 33 to see examples of other children’s animal drawings. Have fun exploring Ranger Rick Jr. with your child.